Please join Kol Ami for our very warm and special Shabbat services. We celebrate the Sabbath with song and spirit, blending traditional prayers, new approaches to the prayers’ meanings, English readings that engage both the mind and the heart, and of course lots of singing. Kol Ami holds three services each month, usually one on Friday evening and two on Saturday morning. Services are led by members of our community, guests or by Rabbi Gilah Langner. A complete list of upcoming services is available on our Events page. Bios of members and guests who lead our services are found on our Kol Ami Leader Biographies page. 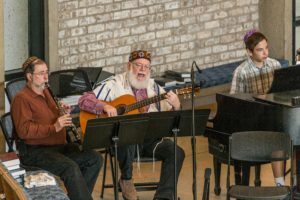 Reconstructionist services may vary in format, but they always include plenty of opportunities for participation, joyous singing, learning and celebration. Our services are very understandable to both people experienced in traditional worship and newcomers or people who want to learn more about Jewish tradition in a meaningful way. This will be a great opportunity to experience Reconstructionism’s contemporary approach to Judaism. It wouldn’t be a Jewish event without a small nosh and time to make new friends, so we will have a pot luck Oneg Shabbat after each service. Please bring a dairy/vegetarian item to share. On Friday nights, we share dessert dishes. Following Saturday morning services, we share a potluck lunch, so please bring an entree, side dish, or dessert. Coffee and tea will be provided. Click here to view the Shabbat hosting schedule (Members only). Kol Ami recognizes those who need healing at each of our services. Please e-mail Healing with the names (Hebrew, English or both) of those you know who need healing. The names will be read aloud during the service. Please e-mail the names a minimum of 48 hours prior to the service in order to guarantee they will be read.